The Cadillac CTS-V had one job to do when it was brought kicking and screaming into the world back in 2008: beat the BMW M5. True, the supercharged sedan was also supposed to steal the spotlight from Mercedes-Benz and Audi (among others), but every sports sedan inevitably ends up getting compared to the M5. How is the battle going eight years in? Pretty damn good if you ask us. We got our hands on the 2017 Cadillac CTS-V for a week and found five reasons to buy it over the M5. 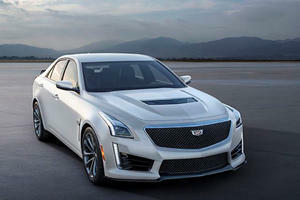 The CTS-V has a supercharged 6.2-liter V8 making 640 horsepower and 630 lb-ft of torque. The M5 is powered by a twin-turbo V8 producing 560 hp and 500 lb-ft of torque. The Cadillac only offers an eight-speed auto. The BMW features a seven-speed dual-clutch and six-speed manual. The Caddy is lighter, 4,145 pounds versus 4,354 lbs (manual) / 4,387 lbs (automatic). The CTS-V can hit 200 mph. The M5 is electronically limited to 155 mph. 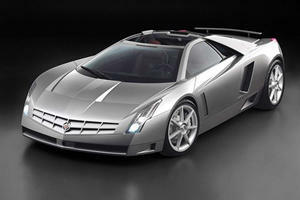 The Cadillac does 0-60 mph in 3.7 seconds. The M5’s fastest time is 4.2 seconds. The CTS-V is the more powerful car, but that doesn’t give an accurate depiction of just how much fun this thing is. At times it’s hard to remember that the CTS-V isn’t a muscle car. Launch control is present and much-needed as the back end goes nuts with even the lightest tap on the gas, especially from a rolling start. But don’t think the CTS-V can’t take corners. The electronically assisted steering has a good weight when not in Tour mode. An electronic limited-slip differential, Magnetic Ride Control, massive Brembo brakes and a suite of driving modes add much-needed refinement to the on-road experience. The Performance Data Recorder (a $1,600 option) encourages you to indulge your track day urges, recording laps times and tracking valuable metrics. Without all this, the CTS-V is just a pricier Hellcat. With them it’s a reminder of what the M5 was: A fire-breather capable of holding its own on the track. 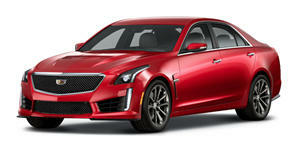 The CTS-V starts at $86,590, a price which includes free driving school! The M5 starts at $96,095. Our tester stickered at $109,610, a price the M5 also sniffs once you start with the options. The majority of the CTS-V’s $23,020 in extras came from carbon fiber add-ons. We wouldn’t have given back the carbon fiber hood vent, front splitter, rear spoiler and diffuser for the world. By contrast the only real option the M5 has that we would have liked to see Cadillac offer are carbon ceramic brakes. It also offers a performance package but that only ups horsepower to 575 ponies. Whether you’re comparing these two straight up or with options added on, the Cadillac is the better buy. The CTS-V doesn't have a better cabin than the M5. Still, it’s a nice place to be. Standard features include an 8-inch infotainment touchscreen, Apple CarPlay and Android Auto, auto parallel parking, a heated steering wheel, wireless charging pad, curb-view camera and heated and ventilated front seats. The $2,075 Luxury Package added on on tri-zone climate control, heated rear seats, sunshades and the awesome, if still mostly a novelty, rear camera mirror. Our biggest complaint is the Recaro seats, which are superb but can get uncomfortable on longer drives. While the cabin won’t blow you away you do get a lot for your money and the design and material quality prove Cadillac is done playing catch-up. The M5’s design could fairly be described as subtle. Sure, the air intakes are wider, the brake rotors are drilled and there’s a quad exhaust. And there’s that special M badge. That’s it. By contrast the CTS-V has a menacing front end highlighted by its bulging and vented hood. The brakes look like plates used to serve up the diabetes-inducing food challenges on “Man v. Food.” The exhaust pipes are bigger and bolder. However, the real highlight of the CTS-V is the aforementioned Carbon Fiber Package. The M5 has always shied away from the spotlight when it comes to exterior design. 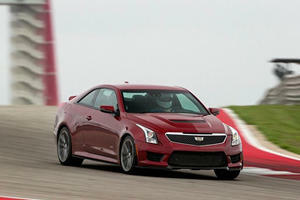 The CTS-V unabashedly courts attention and has a look designed to appeal first and foremost to enthusiasts. When the next-gen M5 comes out it will pack 600 (or more) horsepower, be lighter, look sexier and feature the latest tech. It may very well blow the CTS-V out of the water. One thing it won’t have is the purity/madness that ridiculous amounts of horsepower and RWD brings. Yes, we know the next M5 will be able to switch to rear-wheel drive at the touch of a button. But until you touch that button power will be going to all four wheels. We’ll admit that there were times when having 640 horses galloping out of the rear wheels put us on edge, but wouldn’t you rather rein in oversteer than have to push a button to initiate it? Except this time, make it a world beating supercar. Will This Make The 2017 Cadillac ATS-V And CTS-V Even Better Deals? Cadillac wants you to actually get the full potential out of your new V car. So what is the new secret ingredient that GM is using?